Kyocera P6026CDN Expert Reviews - Read Reviews and Buy Smarter Online. 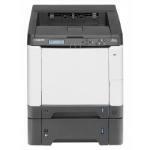 Verdict: The Kyocera Ecosys P6026cdn is the latest office class color printer from Kyocera and replaces the FS-C5250dn. The P6026cdn is one of several new models to use this very advanced third generation Kyocera engine that combines all the best features of previous generations.